(Nanowerk News) Researchers at the Universities of Basel and Valencia have reported important advances in the development of next generation lighting technologies in the journal Chemical Science ("Exceptionally long-lived light-emitting electrochemical cells: multiple intra-cation Π-stacking interactions in [Ir(C^N)2(N^N)][PF6] emitters"). The team has built metal complexes decorated with rings that arrange themselves to form a shell around the molecule. "It is a little bit like a flower closing up at night - the flat, petal-like rings fold up about the metal to make a compact and robust structure", says Constable. 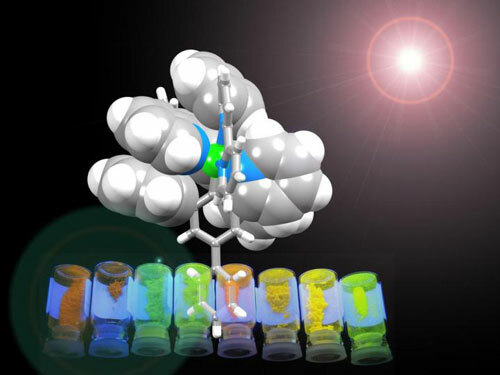 These supramolecular interactions make the complexes exceptionally stable. Furthermore, molecular tuning of the components allows a tuning of the color of light emitted, bringing the goal of white-light emitting devices one step closer.